The Institute of Life Sciences (ILS), an autonomous institute has been brought under the fold of the Department of Biotechnology, Government of India in August 2002. The institute is located in close proximity to other research institutions at Bhubaneswar. The institute was earlier established on February 11, 1989 and was under the administrative and financial control of Department of Science and Technology, Government of Orissa. 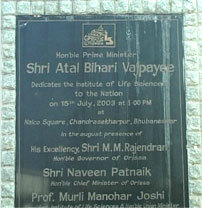 Prime minister of India dedicated the institute to the nation on July 15, 2003 with a declaration to develop the institute as a “National Centre for Excellence”. The mandate of ILS is to undertake basic and translational research in frontier areas of life sciences. The research interests of the faculty are in three major areas: (a) Infectious Disease Biology, (b) Gene Function and Regulation and (c) Translation Research and Technology Development. In addition, new collaborations with industry have been established to tap commercial potential of laboratory science.